Te decet hymnus in Sion, Domine. In Judaism God is like what does and has done. Thus we read periodic accounts of divine actions past and present (from the perspective of the authors) in the Hebrew Bible. Psalms 65, 66, and 67 fit this theme well; God’s generosity and power are evident in nature, the life of the Hebrew nation, and individual lives. The proper responses are gratitude and obedience to divine law. God’s eternal power and divinity, as the apostle Paul says in Romans 1:20. All these things are enough to convict humans and to leave them without excuse. as much as we need in this life, for God’s glory and for our salvation. The concept of the Book of Nature is a helpful one, for, if one seeks to learn about the Creator, creation should be part of the curriculum. One might think of “This is My Father’s World,” by the Reverend Maltbie Davenport Babcock (1858-1901), a Presbyterian minister who relished the created order and thereby came closer to God. May we study the Book of Nature closely and be the best possible stewards of it. Among the repeated themes in the Bible is that God is on the side of the righteous. This might prove difficult to see sometimes, given persecutions and other hard times, but texts acknowledge this reality. The composite theme holds that being on God’s side does not automatically mean that life will be prosperous, healthy, and easy, but that God will be present with one during good times as well as bad times. Sometimes, in fact, one will suffer for being on God’s side. I have had difficulty reconciling the God of battles in Joshua 10 with the God of Jesus, but I must, in all honesty, acknowledge that Revelation is not the most peaceful of books in the Bible and that its depiction of God is not pacifistic. The truth is that we mortals can never, as much as we might try, remove our biases from our quest to understand God as much as we can, which is quite partially. May we, therefore, consider our God concepts with humility, recognizing that we are all partially mistaken. Fortunately, God remains faithful to divine promises and accepts with much kindness that which we offer sincerely. Mercy flows abundantly. We come to God with our fears, hopes, preconceptions, and the desire to obey divine commandments, but often our spiritual blind spots prevent us from understanding those commandments fully and recognizing many of our sins. As in the story preceding the pericope from Mark, we bring all we have–a few loaves and fishes, to speak–and God transforms that which is inadequate into that which is more than sufficient. May we take comfort in that reality. you make the dawn and dusk to sing for joy. God, the biblical authors affirmed, controls nature. This theme occurs in the plagues upon Egypt, Jesus walking on water, droughts in ancient Israel and Judah, et cetera. 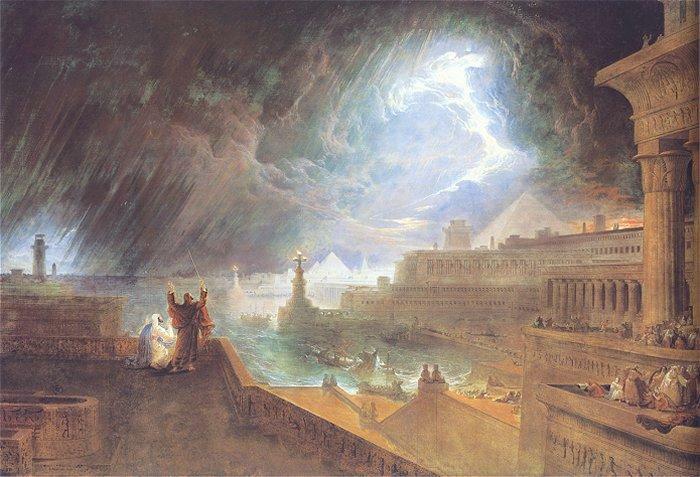 The pericopes from Exodus, in which the theme of God being in control of nature occur, constitute a narrative which contrasts with the storm at sea then the shipwreck in Acts 27. Innocent Egyptians suffered and/or died in the plagues, but all hands survived in Acts 27. The plagues led to the freedom of the Hebrew slaves, but the voyage of the prison ship took St. Paul the Apostle to his trial, house arrest, and execution at Rome. I can only wonder about the fates of the other prisoners. Drowning at sea might have been a more merciful way of dying. The Exodus pericopes remind me that sometimes a divine rescue operation comes with a body count. When oppressors insist on oppressing the end of their oppression is good news for their victims yet bad news for them. Sometimes innocent people become casualties in the conflict, unfortunately. I wish that all were joy, love, and happiness. I wish that nobody would ever oppress anyone. Violence would be absent from my utopia. Yet Utopia is nowhere, potentates are often prideful and not concerned with the best interests of their people, and circumstances escalate to the point that some people will suffer from violence one way or another. This proves (as if anyone needs confirmation) that the Kingdom of God is not fully realized in our midst. May we pray for the day that it will become fully realized on this plane of existence. The prophet Jeremiah would have been thrilled for that statement to have applied to Jerusalem. Alas, some people there even sacrificed their children to pagan gods at the valley whose name became the source for the label “Gehenna,” a place of suffering in the afterlife. 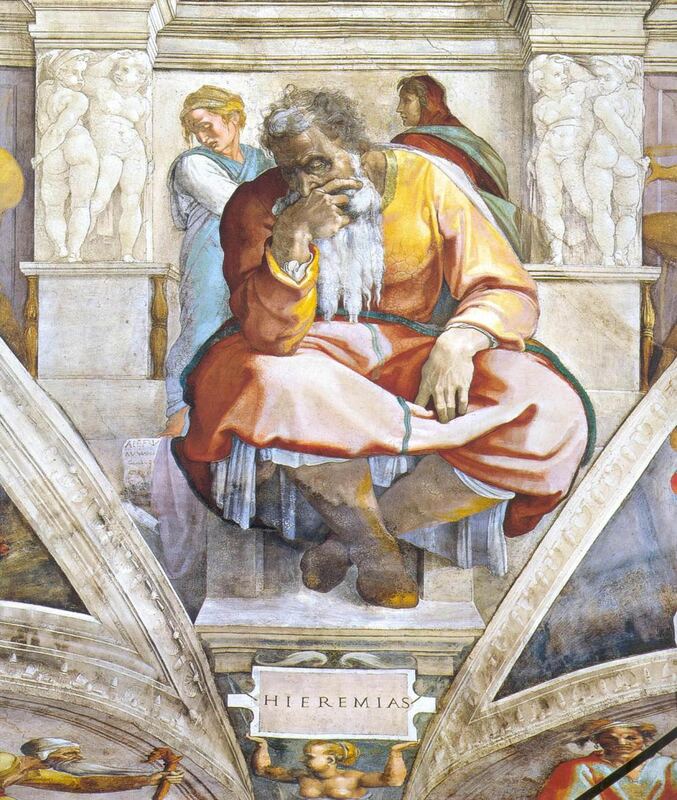 Jeremiah condemned such idolatrous and violent practices and pronounced divine punishment. For his trouble he faced flogging and imprisonment. Yet those who mistreated him would, he said, die as exiles in Babylon. That prediction came true. A common expectation in New Testament times was that Jesus would return quite soon. It was an age of apocalyptic hopes that God would end the violent and exploitative rule of the Roman Empire, set the world right, and that the divine order would govern the planet. In that context a lack of repentance was especially bad, as in Luke 10:13-16. In Revelation 18 the Roman Empire had fallen (within the Johannine Apocalypse only), but the imperium survived well beyond the first century of the Common Era. Discouragement and scoffing had become evident by the 80s and 90s, the timeframe for the writing of 2 Peter. Yet the calls to repentance remained applicable. Divine time and human time work differently, but some things remain the same. Fearful theocrats react badly to honest prophets. The realization that God has not met a human schedule leads to bad spiritual results. Violent, oppressive, and exploitative governments continue to exist. And the promise that God will destroy the evil order then replace it with a holy and just one remains a future hope. In the meantime we would do well to consider the moral lessons of Revelation 18. For example, do we benefit from any violent, oppressive, and/or exploitative system? If so, what is the “Babylon” or what are the “Babylons” to which we have attached ourselves, from which we benefit, and whose passing we would mourn? Almighty God, we thank you for planting in us the seed of your word. …it is better for you to have one man die to have the whole nation destroyed. That was not the only germane conflict, for the Gospel of John came from marginalized Jewish Christians at the end of the first century C.E. They had lost the argument in their community. Certainly this fact influenced how they told the story of Jesus. I know enough about the retelling and reinterpretation of the past to realize that we humans tell history in the context of our present. The present tense shapes our understanding of events which belong in the past tense; it can be no other way. What must it be like to experience great hope mixed with subsequent disappointment–perhaps even resentment–inside which we frame the older hope? Faithful Jews of our Lord and Savior’s time knew that feeling well when they pondered parts of the Book of Isaiah and other texts. 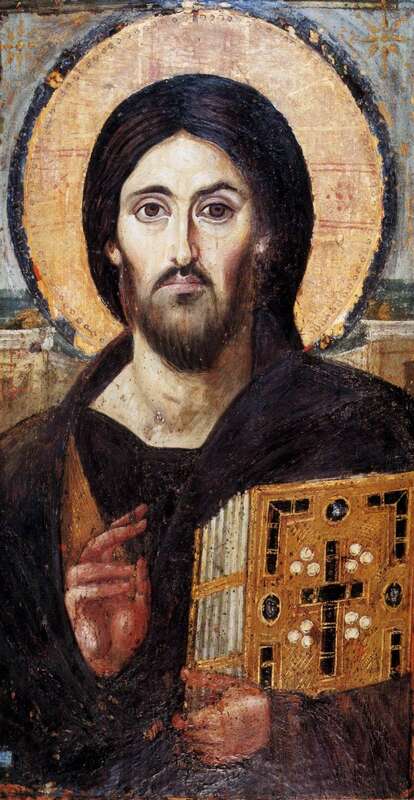 The Johannine audience knew that feeling well when it considered Jesus. Perhaps you, O reader, know that feeling well in circumstances only you know well. You were sold for nothing, and you shall be redeemed without money. I point to the agape God extends to us and which is the form of love in 1 Corinthians 13. Love and forgiveness are infinitely superior to anger, resentment, and scapegoating.